Zinna Blossoms decorative entry mat with elegant yet fun designs. UV stabilized colors. Water absorbent carpet. Thick rubber backing. Finally indoor entry mats with outdoor durability and heavy weight construction to keep the mat from sliding on hard surface flooring. 3D impression mats have a specially-developed carpet that produces high contrast and sharp printing details. Molded rib construction scrapes shoes clean and hides dirt below shoe level. Great water absorption and environmentally-friendly recycled rubber backing with carpet surface made from recycled plastic bottles (PET). This carpet surface removes dirt off shoes and absorbs water, keeping moisture in the mat and off your indoor floors. The carpet top is stain resistant and the base is made of heavy duty, molded, 100% recycled rubber - built to last. 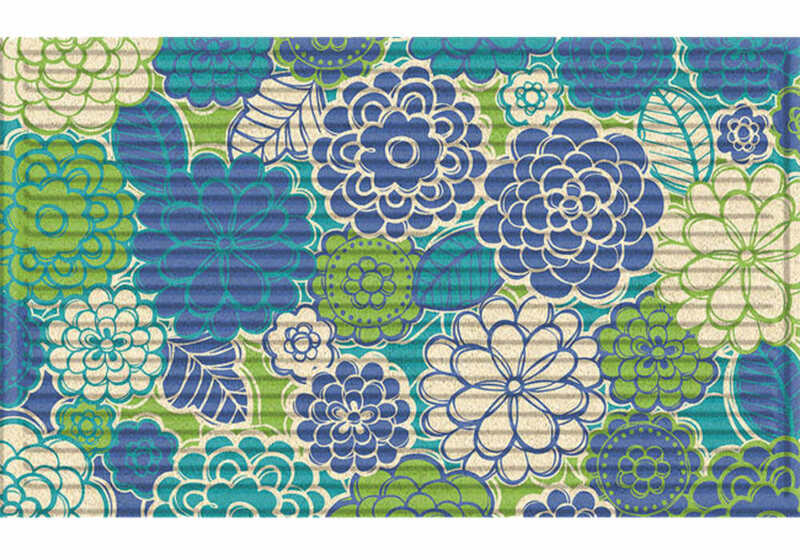 These are not only decorative door mats but are also functional - the best of both worlds! Ideal for inside the door or covered outdoor entry way. Excellent quality and helps the environment. Our rubber back mats are made from recycled tire scraps. This product is 95% recycled by weight. Finally indoor entrance door mats with outdoor durability and heavy weight construction to keep your front door mat from sliding on hard surface flooring. 3D impression colorful doormats have a specially-developed carpet that produces high contrast and sharp printing details. Molded rib construction scrapes shoes clean and hides dirt below shoe level. Great water absorption and environmentally-friendly recycled rubber backing with carpet surface made from recycled plastic bottles (PET). This carpet surface removes dirt off shoes and absorbs water, keeping moisture in the welcome mat and off your indoor floors. The carpet top is stain resistant and the base is made of heavy duty, molded, 100% recycled rubber - built to last. These are not only decorative designer door mats, but are also functional - the best of both worlds! Ideal for inside the door or covered outdoor entry way. Excellent quality and helps the environment. 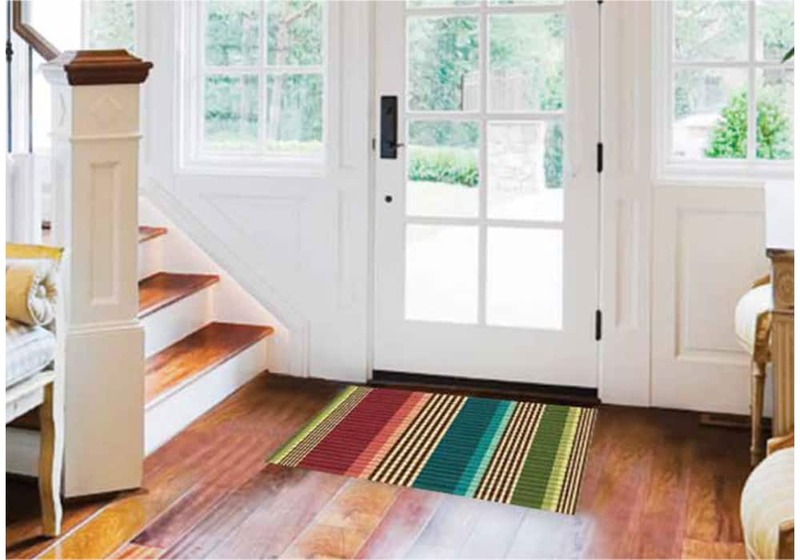 Our rubber backed home door mats are made from recycled tire scraps. When you purchase one of these entry door mats, you are helping to keep America clean by keeping these tires out of landfills! This product is 95% green by weight.